The black plumage and red shoulder with the yellow bar on the wing of a Red-winged Blackbird, is a distinct sign that this is a male bird, the females have a strange brown hue to their plumage. The yellow markings on its wing are only visible while the Red-winged Blackbird is resting like the one perched on a branch on this tree along the banks of the Niagara River in Niagara Falls, Ontario. The male Red-winged Blackbird will grow to about 9.5 inches in length and weigh about 2.2 ounces with the female being slightly smaller at 7 inches long and 1.2 ounces. These sharp looking little birds feed on seeds from weeds, grains like corn and rice, berries and various insects such as dragonflies, damselflies, butterflies, moths and flies. If hungry enough, the Red-winged Blackbird will also feed on snails, frogs, eggs, worms, spiders and mollusks. 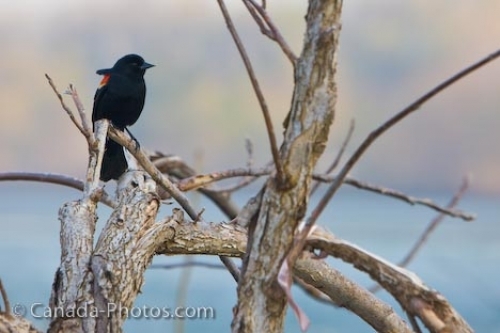 Picture of a Red-winged Blackbird perched on a barren tree along the banks of the Niagara River in Niagara Falls, Ontario. As we took this picture, the Red-winged Blackbird kept his eye on us but remained still. Red-winged blackbird, Agelaius phoeniceus, sitting in a bare tree along the banks of the Niagara River, Niagara Falls, Ontario, Canada.